(Chris Detrick | Tribune file photo) Visitors take pictures and hike around Delicate Arch in Arches National Park on Saturday, March 5, 2016. Federal officials are holstering a proposed reservation system for Arches National Park in the face of mounting opposition and concerns about the deep economic wounds such a program could inflict by slashing visitation at the world-renowned southern Utah attraction. 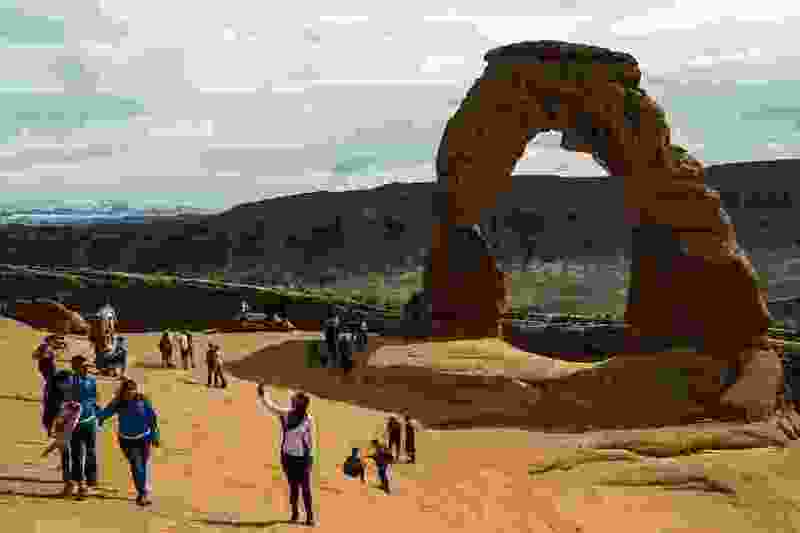 Arches officials unveiled the proposal in 2017 as the central part of a plan to reduce traffic congestion, which has turned a park visit into a nightmare on busy days. The idea became mired in controversy, with many critics arguing a reservation requirement would make it too difficult to go to the park — which saw a record 1.7 million visitors last year — spontaneously or without advanced planning. The pressure grew this month with the public release of an economic impact analysis showing that nearby Moab tourism businesses could experience a $22 million hit in the program’s first year. The analysis predicted visitation would dip by 5 percent to 10 percent, then rebound as the public adjusted to the new system. Park officials were preparing to roll out the reservation plan that had been years in the making, scheduling an open house in Moab for early April. But the National Park Service announced Monday that it was postponing the meeting until summer. The park service will use the public feedback to refine its plan, he added. The news troubled the National Parks Conservation Association (NPCA), which has long backed the reservation concept, developed under the leadership of Arches Superintendent Kate Cannon, as a possible solution to traffic woes at Zion, Yosemite, Rocky Mountain and other crowded national parks. She said support from the community is critical to the success of any plan to reduce congestion and conceded that some Moab residents have reservations about requiring park visitors to schedule their entries. • Paving additional access roads into and around the park to spread visitors around Arches. • Creating a shuttle system that could funnel many visitors into the park without their cars. These costly options, which enjoyed some support among Utah’s political leaders, might now be back in play. Pollard worries more pavement would just toss more cars into the park without addressing congestion. Besides, she added, cutting new roads would not be possible since the park’s terrain is managed as wilderness everywhere away from existing roads and trailheads. Cannon is scheduled to discuss the park traffic plan at Tuesday’s meeting of the Grand County Council, according to Councilwoman Mary McGann, who believes the reservation proposal has merit. She contends protecting the park and its geological wonders should be the primary concern. One critic, Moab entrepreneur Michael Liss, called the decision a “big win” for park access systemwide.